The second book in the VIRTUAL ARCANA series. Mysterious cards keep appearing in Kelsey’s life, stirring up questions and forcing her to keep secrets from her sister, Keekee. Triggered by Kelsey’s fear and Keekee's worry, the twins become bright blips on their tyrannical government’s radar. Xander’s magic seems to be their only chance at escaping a dangerous confrontation, but is Kelsey willing to break multiple laws and finally step into Xander's illegal world of virtual reality? I thought I was hooked on this series after reading The Fool, but now I know. Karen Amanda Hooper does an amazing job of pulling readers into this story. She gives us just enough information to keep us moving forward through the story. I'd have to say that Virtual Arcana is quickly becoming one of my favorite series and I can't wait for the next installment. 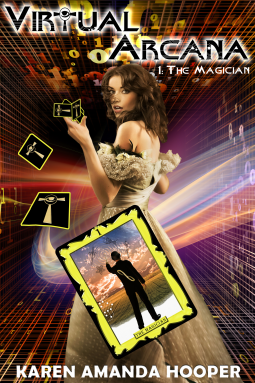 The Magician pulls readers even further into Kelsey and Xander's story giving us the answer to some questions, but posing even more by the end of this latest installment. It opens up where The Fool ended, with Kelsey in a bit of a mess. She's trying to figure out what's going on while still protecting her family. Through the story she is drawn into a web of mystery as the governement begins to reveal its true colors. Xander turns out to be more than he first seemed as well, providing Kelsey with help in the most unexpected of ways. Both Kelsey and Xander got a lot of time in this book and I found myself liking them both even more. Kelsey for her dedication to her family and her desire to keep them safe and Xander for his curious mix of genuineness and mystery. I cannot wait to see more of both of these characters as the story progresses. I loved getting to see more of Keekee and their parents in this book as well as get introduced to a few new characters who I am eager to see more of. The Magician is a stunning continuation of Karen Amanda Hooper's Virtual Arcana and I cannot wait to see more in this story. Don't miss out on this next part of Kelsey and Xander's exciting tale. Note: I received an advanced electronic copy of this book from the author in exchange for my fair and honest opinion which I have stated above.